Find the news issued by us in our news archive. Building upon the Let’s Do It Together campaign we launched in December, leading up to and during the Easter Bank Holiday, (Monday 15th April until Tuesday 23rd April) across the NHS in Halton, Knowsley, St Helens and Warrington we’ll be running a joint social media campaign. The legal right to a personal health budget has been extended to people who access wheelchair services, through Personal Wheelchair Budgets (PWB), which is replacing the current wheelchair voucher scheme. Warrington and Halton Hospital’s Nutrition and Dietetic team are once again supporting this year’s Nutrition and Hydration Week (11-17th March). This year’s focus is on ‘Reinforce, Focus and Energise’ and to highlight the importance of nutrition and hydration. Dawn Wright, an associate practitioner at Warrington Hospital’s Emergency Department has been living with cervical cancer since December 2017 and continues to work throughout her diagnosis and treatment. The main car park from Lovely Lane will be re-surfaced. Come along on Saturday 9th March, 10:00am - 2:30pm in the Antenatal Clinic in Croft Wing, Warrington Hospital. Planned and Emergency Hospital Care - What Matters to YOU and YOUR Individual Needs? 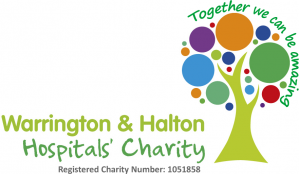 Warrington and Halton Hospitals Smart Heart campaign, which works with children across the boroughs and further afield will be displaying their artwork at an exhibition between 1st and 13th February, at The Gateway Centre in Warrington.